Everything you wanted to know about old woodworking tools and machines! Welcome to Old-Woodworking-Tools.net ! This web site is devoted to providing information and resources to those interested in woodworking, old woodworking tools and vintage woodworking machinery. My first wood shop was put together by going to garage sales with my dad and bringing home old woodworking machines. We'd locate the owners manuals, tear them apart, clean and rebuild them. Before long they were making sawdust in our wood shop. Then we started collecting old woodworking tools including hand tools, planes, chisels, tool chests and other antique woodworking hand tools. 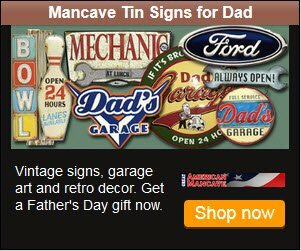 Check out Great American Mancave for some of the best reproduction tin and metal signs. Great for Dad's workshop, garage, or mancave. You'll be glad you did! I spent twenty years as a furniture and cabinet shop owner and high school wood shop teacher. You'll find much of what I've collected and learned about old woodworking tools, vintage machine restoration, and antique woodworking tools on this website, but you'll also be able to contribute your own knowledge and expertise about woodworking tools as well. I hope you find this to be a valuable resource for you and that you'll be willing to share your own knowledge and expertise about old woodworking tools. The old woodworking machines section includes information, photos, machine manuals, catalogs, advertisements, logo information and a lot more about vintage mostly American made woodworking machinery. Most of the machinery discussed on this site is the size and type commonly found in small to medium sized furniture and cabinet shops, schools, and home woodworking shops. You'll find a lot of information about some of the most vintage American made woodworking machinery brands such as Delta, Rockwell, Boice Crane, Walker Turner, Craftsman, Powermatic, Oliver, Davis & Wells, and other wonderful old woodworking machinery. I've owned and used almost every tool Delta manufactured including those that date back to the 1930's... I just wish I had the room to keep them all. My favorites are those that came on the old art-deco cast iron stands. There's no comparison between a Delta 6" jointer on a heavy art-deco cast iron base and one on the newer sheet metal stands. Here you'll find photos of most everything I've owned as well as tool manuals, vintage advertisements, company history, old parts for sale and a lot more. In the Antique Woodworking Hand Tools section, you'll find information, photographs, and more about old woodworking tools dating back to the Civil War and before. Some of the collection dates back to the early 1700's and includes Cooper's and Shipwright's tools. In addition to collecting and restoring old American made woodworking machinery, I've also been collecting and antique woodworking tools. My favorites are the old Stanley metal planes dating back to the Civil War. 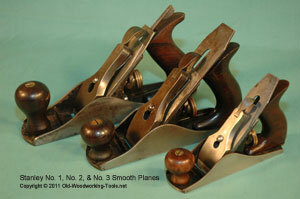 But I've also got a few of the older wooden molding planes, plow planes and others in my collection too. Here I've photographed and documented many of the old tools I've collected including Stanley planes from all eras, Coopers tools, Shipwrights tools, levels, drills, layout tools including squares, marking gauges, and more. You'll find everything from old hand tools for sale to copies of tool catalogs, advertisements and maybe even a few reproduction box labels and decals for Stanley tools. There is a growing library of information about Stanley Tools, Stanley Planes, Millers Falls, Sargent, Craftsman Disston, and other vintage tool brands coming to this site. See our new store with a growing collection of used tool and machine parts for vintage Craftsman and Delta woodworking tools. If you're looking to replace that broken or missing part on you favorite machine, chances are you'll find it here. 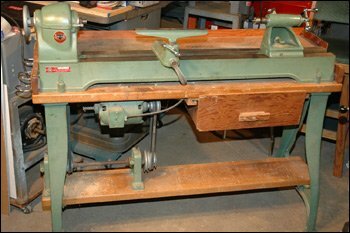 I'm sharing photos, information, machine manuals, and tool catalogs for hundreds of old woodworking machines and tools that I've collected, restored, and used over the years. I hope you feel free to contribute pictures and stories of your own old tool finds, collections, and stories here on Old-Woodworking-Tools.net. You can use this easy to upload form to share your latest prize woodworking machine or tool. Order Your Free Rocker Woodworking Catalog Here! Contribute to this site - Add Your Own Tool Photos! Contribute old tool publications, articles, catalogs, etc. Created by an old woodworking geek and tool collector, Old-Woodworking-Tools.net provides a growing library of free resources for the woodworking and tool enthusiast. I'm a former furniture and cabinet making teacher and tool collector. This site will continue to grow as new resources and tools are added. Check back often to stay up to date on the latest additions and please join in contributing more information to this site.